Contact lens success is a result of careful measurement and detailed history combined with thorough instruction in lens care and handling. 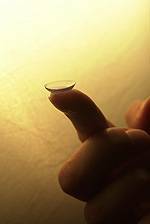 Dr. Piper uses diagnostic contact lenses to determine the safest lens for uncomplicated lens wear. This involves progress exams weekly for beginning contact lens wearers and regular follow up care every 6 to 12 months, depending on the type of lens used. Dr. Piper fits all types of contact lenses, both tinted and clear, for daily wear, extended wear, astigmatism correcting lenses, bifocal lenses and hard gas permeable lenses. Our guarantee covers all types. If for any reason you are not satisfied with the comfort or vision of your new contact lenses we will correct this problem or issue a full refund of your contact lens material fees.